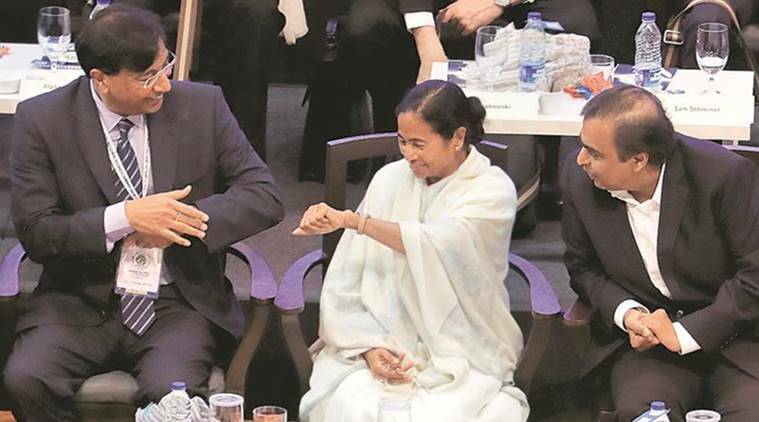 Maintaining that West Bengal is now “the investment destination”, Chief Minister Mamata Banerjee on Tuesday inaugurated the two-day Bengal Global Business Summit (BGBS) in the presence of the industry captains. Asserting that Bengal will not deprive anyone, Mamata asked them to invest in the state, as it does not believe in “intimidation and discrimination”. “Accountability, credibility, transparency, sincerity and punctuality are our credentials. I will request all of my industry captains and friends who have come from across the world… Bengal is now the investment destination. Bengal has potential in agro-based industries as well as in horticulture, power, port, transport, industry, IT, health, urban and even in education sectors,” she said while speaking at the fourth edition of the summit in Kolkata. “Please consider Bengal as your home, as we treat you as our family members. Bengal means business and we are serious and committed towards it,” she added. Mukesh Ambani, L N Mittal, Sajjan Jindal, Sanjeev Goenka and others attended the summit, where the industry captains made an investment pledge of around Rs 17,000 crore to the Mamata government. Nine major countries have become partners for the summit this year — Germany, UK, Italy, France, Poland, South Korea, Czech Republic and UAE. Countries like China have also sent delegations. No minister from the Centre was present at the summit. Union Minister for Road Transport and Highways Nitin Gadkari, who was scheduled to attend the meet, chose to stay away following alleged attack on the BJP rally by ruling Trinamool Congress workers on January 12. After the incident, state BJP president Dilip Ghosh had said that Gadkari will not attend the summit.